I don’t know if you noticed this, but in the fully rendered trailer for The Elder Scrolls Online, the Aldmeri Dominion elves looked nice. In traditional fantasy lore like Lord of the Rings, elves are some of the most beautiful creatures in the universe. However, I’ve always seen the Elder Scrolls elves as somewhat alien — like the grey-men kind of aliens. In fact, the dark elves with their ashy skin really looked like grey men, especially if they were bald. Yet that particular MMO trailer presented a different kind of elf. Of course, that’s just a CGI trailer, and CGI trailers rarely represent what we will see in the game. I can accept that. But more and more screenshots have popped up and more in-game videos have appeared on different websites, and in each of them, it appears to me that the elves — the “mer” — have received a makeover. And it’s not just the elves; even the Argonians and Khajiit look different. I suspect there’s a reason for this. I don’t think the art for TESO is bad; I believe just the opposite. The more I see of this game, the more anxious I get about having it on my computer and playing it. The landscapes really capture the feeling of the other Elder Scrolls games, specifically Skyrim and Oblivion. The world has that bit of dingy grit that the other games had. The world is gorgeous but lived-in at the same time. Stylistically, the landscapes are similar to Guild Wars 2′s but with a rough edge and muted colors. This feeling transitions to the character models, too. The armor we’ve seen so far has that well-worn style. And every piece looks as if it could use some steam-pressing. Yet if you compare the skin textures and modelling of the characters themselves, you might notice that ZeniMax created a cleaner look than seen in previous Elder Scrolls games. I know there were complaints when Skyrim was released that many of the characters were ugly, especially the female characters. In fact, the most popular mods for Skyrim are the ones that feature (arguably) prettier character models. More than likely, TESO will not allow for mods as the previous single-player games did, so perhaps ZeniMax saw took a clue from the modding community and made the models more aesthetically pleasing from the get-go. I do have another wild theory as well. I know many readers are going to disagree with me, but that’s OK; I enjoy friendly discourse. I submit that the engine will not allow for a very gritty look to the character models. ZeniMax admitted that the first screenshots were taken in HeroEngine. Take a look at screenshots from Star Wars: The Old Republic or The Repopulation. Did you notice a sharp sheen on the character models? I don’t think “unnatural” is the right word for it, but it’s certainly a heavy reflection in the bump maps. I believe that if ZeniMax used the same types of textures found in Skyrim in TESO, the characters would look as if they were covered in plastic wrap, so to counter this, ZeniMax gave the characters smoother skin. “But The Elder Scrolls Online doesn’t use HeroEngine anymore!” you say. We’ll touch on that later. I would like to know what your thoughts are on the change in character portrayal. Maybe you don’t see the difference; tell me why you don’t. Or if you do see the difference, what are your theories as to why we see this change? 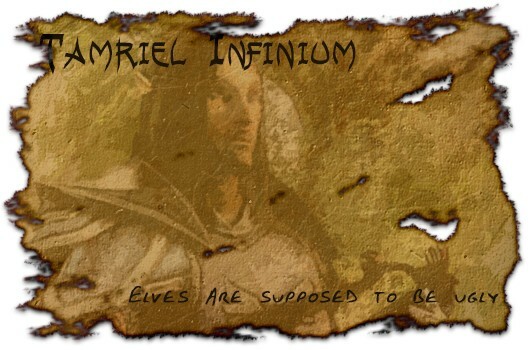 Every week, I try to highlight an Elder Scrolls fansite or community, but unlike other community spotlights, this one should feature a specific article or part of a fansite that stood out to me or is relevant to the weekly topic. The Tamriel Foundry takes this week’s focus. I spoke a lot about the technology behind The Elder Scrolls Online, but where did I get that information? Nope, it was not the Tamriel Foundry. However, the Tamriel Foundry houses an incredible FAQ page that addresses many of the questions regarding the design and technology behind ESO. And most importantly, it references the articles or video in which that specific answer can be found. It’s exciting to see a very complete look at what we know so far about The Elder Scrolls Online. For instance, did you know that The Elder Scrolls Online could have been titled Elder Scrolls: Origins, Tamriel, or Elder Scrolls: Empires? That tidbit of information appeared in an interview with Creative Director Paul Sage. I recommend that you hop on over to that Tamriel Foundry and check out that FAQ page, especially if you’re just now getting into TESO. Many commenters from last week are concerned about the factional divide and the communication and balancing issues that stem from that. Woolydub had some interesting thoughts on the matter: “The problem I have and think I have commented on this before is the imbalance it will cause in factional PvP. Human races are mostly played more than non-human races. I am sure there is a game or two out there where this isn’t the case, but in every game that releases stats on races played, if humans are playable, they are the dominant species chosen. Why is this a problem? There are factions in TESO that don’t have humans. Those factions will automatically be at a disadvantage.” I’m going to have to agree that we will definitely see heavy leans toward factions with humans. The Aldmeri Dominion will not feature any human races, and it will likely be the smallest faction, too. Hopefully, players will see that, and those awesome people who like to side with the underdogs will take advantage of the situation. This week, I’d like to know if you think ZeniMax is still using HeroEngine. We know the studio licensed it to build the concept, but the studio has since said that the engine it currently uses is proprietary and created by ZeniMax. That could mean that it’s heavily modifed the game engine to claim ownership, which is more than understandable and not shady, but it is common. Plus, the screenshots and videos, even of recent gameplay, still have that tell-tale sheen on the character models. What do you think?